Fantastic! Thank you so much for our amazing experience! 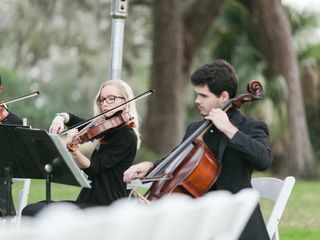 Had the string-quartet play prelude and ceremony music for our wedding. Had them play Beatles songs and movie theme songs, and it sounded so elegant! Dear Robin. Thank you so much for your kind words, and for sending such a beautiful pictures of our ensemble. It was a pleasure providing music of your choice for your special day! Congratulations! I couldn't really hear much but from what I could hear via videos they did an awesome job! Also while I was walking out they helped create such a magical moment! The musicians were excellent and they sounded so beautiful. A lovely experience. On Time and lovely! What beautiful music. We had Daria play the violin at the wedding and the electric violin at dinner. Such an accomplished musician! Loved it loved it loved it! 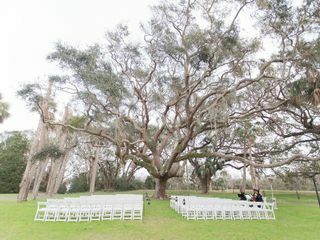 Everything about Adagio weddings was outstanding! Daria is extremely responsive, friendly, and accommodating. 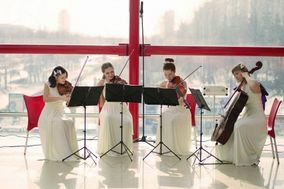 We hired a string trio for our wedding ceremony and reception, and the music was top notch at a very competitive price! Thank you so much! They did a beautiful job at my daughter's wedding and so easy to work with. I would definitely recommend them!! The music was lovely, the musicians took the time to learn new pieces that were not in their normal repertoire. They arrived on time, dressed for the occasion and were very professional. 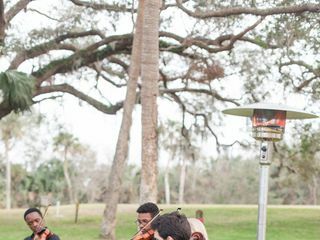 Back in May my husband and I hired Daria to play walk around violin music at our Garden Party I couldn't have been more pleased with her playing and response from our guests. We can highly recommend her and her company to play at your event!!! Daria at Adagio Weddings is amazing to work with! She is so talented and worth every penny. 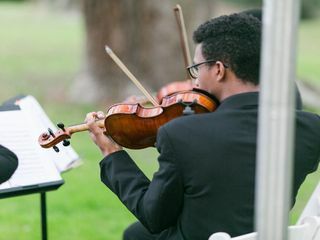 Everyone at my wedding absolutely loved the music from start to finish and it created a beautiful, elegant tone for my ceremony, which to me was very important. Nothing compares to having a live musician(s) at an event, especially a wedding. I'd highly recommend Adagio Weddings to anyone! I am so grateful to Adagio Weddings! Their commitment to customer service is truly unbelievable. Every concern we had was quickly put to ease. Their canopies are BEAUTIFUL and their affordable prices make Adagio Weddings the best choice. They also found the perfect group of musicians to perform a unique blend of classics for our special event. Thank you Adagio Weddings!! A friend of mine told me about Daria when I was looking for a string quartet for our wedding. From the first phone call with Daria she was nothing short of marvelous. She understood exactly how we wanted the music to be and it couldn't have been better. She and her quartet are talented ladies and my wife, myself, and our guests couldn't have been more pleased. Had the good fortune to find Daria and her string quartet for my parents 50th wedding anniversary. The music was lovely and Daria took care of all the details - I didn't have to worry about a thing all day. Thank you Daria for making my parents day even more special. I can not thank Adagio Weddings team enough for everything they did for us on our wedding day. The Acrylic chuppah was amazing,I personally have never seen anything like that, I searched high and low for modern looking chuppah and could not find anything i like,until i met you guys! With light garland inside the transparent columns it had a magical look after dark. Also we didn't have to look for the string quartet. 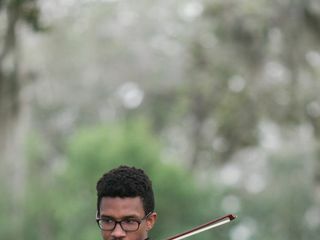 When we found out that Daria is a professional violinist herself,we knew there is no need to look further. She put together beautiful team of musicians and it sounded fantastic. Thank you for making our day so elegant and beautiful!! !